The A7 (Autoroute du Soleil) Bridges and a parallel three span cantilevered steel truss (railroad) bridge cross the Saone just west of La Confluence (shown on the Google earth photo in last week's blog). These are called the Mulatiere Bridges, after a nearby town that was eventually absorbed into Lyon. According to the Structurae Website, the railway bridge is part of the Saint Etienne-Lyon Railroad Line which is 557 km (346 miles) long. The bridge has an attractive fan-like arrangement of diagonal truss members as the truss deepens at its supports. The A7 Bridges are a steel truss arch carrying the southbound lanes (the middle bridge) and a steel I-girder bridge carrying the northbound lanes (the bridge on the left). Originally the highway and railway were on a single structure but a separate railway bridge was built by Maurice Koechlin in 1914 (there's also a parallel railroad tunnel that was built in the 1820's). The railway bridge was damaged during WWII and repaired in 1946. It's 190m (626 ft) long and carries two sets of tracks. It must have been recently sandblasted and repainted because when I looked at the photos of it in Google earth (by trois tiff) it was completely covered in rust! The north approach to the A7 bridges are reinforced concrete box girder spans on two column bents. It's a nice enough looking bridge but nothing spectacular. However, the Directorate of Transport Infrastructure (DGITM) is part of the Ministry of Ecology, so perhaps there efforts are focused on protecting the environment. 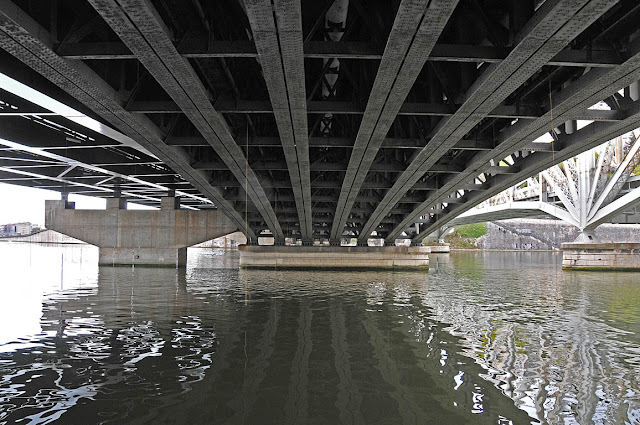 In the photo below we are looking back at the Pont Raymond Barre (across the Rhone) from under the north approach to the A7 Highway Bridges that goes across the Saone.